Samson 2-in-1 Stable Braid Double Braid Bull Rope Red 5/8 x 600. 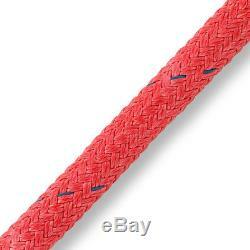 Red 100% Polyester double braid. Flexible and easy to handle. Bright Samthane® coating makes rope highly visible and enhances resistance to abrasion and snagging. 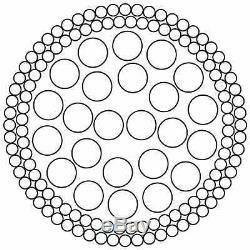 High strength, low stretch, low snag, and minimal UV degradation. Our catalogs feature thousands of quality products for the forestry, environmental science, surveying/engineering, wildlife biology, horticulture, grounds maintenance, and education professionals - and more. The item "Samson 2-in-1 Stable Braid Double Braid Bull Rope, Red, 5/8 x 600" is in sale since Sunday, January 31, 2016. This item is in the category "Sporting Goods\Outdoor Sports\Climbing & Caving\Ropes, Cords & Slings". The seller is "forestry-suppliers" and is located in Jackson, Mississippi. This item can be shipped to United States, Canada, United Kingdom, Denmark, Romania, Slovakia, Bulgaria, Czech republic, Finland, Hungary, Latvia, Lithuania, Malta, Estonia, Australia, Greece, Portugal, Cyprus, Slovenia, Japan, China, Sweden, South Korea, Indonesia, Taiwan, South africa, Thailand, Belgium, France, Hong Kong, Ireland, Netherlands, Poland, Spain, Italy, Germany, Austria, Israel, Mexico, New Zealand, Singapore, Switzerland, Norway, Saudi arabia, Ukraine, United arab emirates, Qatar, Kuwait, Bahrain, Croatia, Malaysia, Brazil, Chile, Colombia, Costa rica, Panama, Trinidad and tobago, Guatemala, Honduras, Jamaica.